A while has past since the last post, and a lot has happened. This includes not least the annual conference of the Association of American Geographers in Tampa (FL) in April during which Mei-Po Kwan and myself convened seven inspiring sessions on the ‘Geographies of Mobility’, in which geographers from many different hues — i.e. working from a wide range of theoretical and methodological perspectives and focusing on a vast array of topics — come together and learned about each other’s work. More recently, 14-16 May, I attended the International Time-Geography Days at Linköping University, organised by Torsten Hägerstrand’s former student, professor Kajsa Ellegård, and her former student, Elin Wihlborg. They did a wonderful job in organising an excellent conference, and took us to the rural area around Åsby parish where Hägerstrand conducted the fieldwork for his PhD thesis (together with his wife). Nowadays Åsby is a peaceful — if ageing and still shrinking — community. It is quite hard to imagine now that this is the setting in which Hägerstrand began to develop his ideas about budget-space, Rum, and the competition between projects for space and time as scarce resources, all of which are at the heart of time-geography. Life in the Åsby area must have been much harsher some 50-60 years ago. Obviously, the fact that we as casual visitors — tourists almost — were visiting the area on a very sunny day must have formatted my perceptions as well. 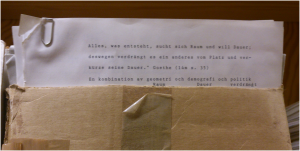 In a way the quote from Goethe typed up by Hägerstrand sums up time-geography quite nicely: “Everything that comes into being searches for space and will last, thereby crowding out something else from its place and shortening its duration“. Competition for space and time — the essence of time-geography as envisaged by Hägerstrand in the 1970s — articulated at its best. This entry was posted in AAG Annual Meeting, Conference, time-geography and tagged AAG, time-geography by timschwanen. Bookmark the permalink.